Are There Real Mermaids in the World? Many wonder if there are real mermaids in the world. In all actuality, this is considered to be one of the world’s greatest unsolved mysteries. This mythical creature is an aquatic based animal that is said to have the upper body of a human female and the torso and the bottom section of the creature represents a water creature, such as a large fish. When you translate the word "Mermaid" in Old English, it literally means "Sea Woman". The most common sightings of mermaids seem to be females, but it is believed that there are male versions of the mythological creature. These creatures are referred to as "Mermen" or a "Merman". However, many will classify both males and females under the name of "Mermaid". It is believed that the real mermaid is capable of carrying a beautiful tune and sings in such a way that their voice literally enchants human ears. There have been numerous accounts stating that when a person became enchanted by the magical voice of real mermaids, they become completely distracted and seem to lose track of their thoughts, what they were doing at the time, and even their actions. Several large water vessels have actually turned around to move closer to the mystical voice of a mermaid and others have literally walked off of a pier and even jumped from their boats while under the spell of the beautiful song that they heard. There are many that believe that real mermaids may try to assist humans, but it is only on occasion. Many have claimed to have been saved by a mermaid when drowning at sea. There are others that drowned at sea and were found, and strange markings appeared on their body. In some of these cases, it is believed that while the mythical animal attempted to assist the person, they may have squeezed their bodies so hard that it resulted in death. There are some that have claimed that they saw a mermaid when they were in need on the open sea, and the creature simply turned its head and did not help. The stories surrounding the sightings of mermaids have perplexed human kind for as long as documentation can tell. The ocean is a vast area where virtually anything is possible. Scientists are still scrambling to learn as much as they are able to regarding the biology of the sea. 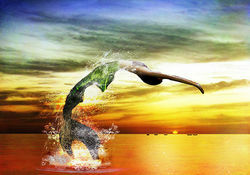 Could there be true to life mermaids? Yes, there could be! However, until someone provides scientific evidence that these mythical creatures exist, they will continue to be one of the greatest unsolved mysteries the world has ever been introduced to.